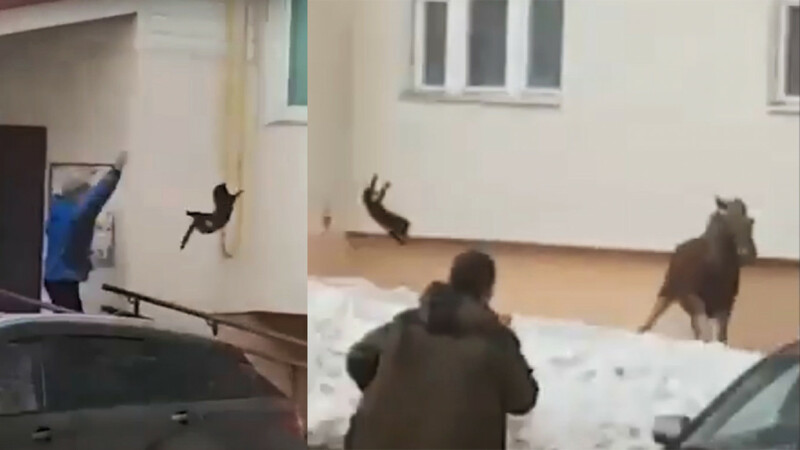 When approached by a wild moose, one local resident of Russia's republic of Bashkortostan took the only reasonable course of action: flinging the nearest available cat to scare it off. In a video widely shared on the Russian internet, the woman, a resident of the town of Oktyabrsky, is seen hurling a cat at the moose. The unsuspecting moose appeared surprised by such unorthodox measures. Fortunately for the (presumably) equally surprised cat, it missed the larger mammal on its impressive trajectory through the air. The elk is seen running away after the near collision. There were no reports on the cat's condition following the close encounter — but it’s likely that the feline landed on all four feet.